Smoking is a major cause of heart disease, bronchitis, emphysema, and stroke and contributes to the severity of colds and pneumonia. Tobacco has a damaging affect on women's health and is associated with increased risk of miscarriage, preterm delivery, stillbirth, and infant death, and is a cause of low birth weight in infants. Furthermore, the secondhand smoke from cigarettes as a harmful health effect on those around the smoke. Nicotine is found in substantial amounts in all forms of tobacco. It is absorbed readily from tobacco smoke in the lungs and from smokeless tobacco in the mouth or nose and rapidly spreads throughout the body. 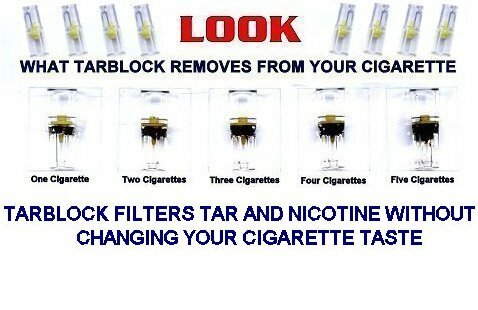 Read the Lab Report and see how Tarblock filters chemicals like Tar, Nicotine & CarbonMonoxide from a cigarette. Click for the Lab Report by "Aristalabs"